Musings on the Ken Ham - Bill Nye Unofficial "Second Debate"
First of all, I'll allow that I'm biased regarding Bill Nye the Scientism Guy (like so), because of his atheistic anti-creation activism, abuse of logic, and militant advocacy for his version of global climate change. Even so, I shall endeavor to be as objective as I can in this article about the unofficial "second debate" between Nye and Ken Ham at the Ark Encounter . I was annoyed while watching it, and one time, a Nye fallacy actually made me LOL. A bit of background is in order. Bill Nye made vituperous attacks on creationism, and against Answers in Genesis in particular. Two AiG scientists challenged him to a debate , especially Dr. Georgia Purdom. He ignored them. Is it because "the Science Guy" is not an actual scientist? He earned a Bachelor of Science, but went no further in his formal education. Eventually, the formal Ham-Nye debate was established . I wrote an article about it, which included several links to reviews and commentaries . In the more recent engagement, he called AiG scientists, including Dr. Purdom, "incompetent". If that is so, why dodge her debate challenge? He should have been able to easily put her away if that was so. Also, he's in no position to call a scientist "incompetent". I'd like to emphasize something about the first debate: it had a dreadful format. Many debates nowadays have "cross examination" or "interrogation" rounds where there is more interaction between the debaters, and the Ham-Nye debate had none. In addition, the format allowed Bill Nye to engage in the elephant hurling fallacy  and employ other disingenuous tactics, such as asking questions of Ken Ham that could not be answered in the two-minute response time allowed at that point in the debate. The "second debate" was not an actual debate, but rather a discussion from opposing viewpoints. Here, we had interaction between Ham and Nye without any kind of formal structure or moderator. The encounter was later streamed, and is available on Ken Ham's Facebook Page and YouTube . Here, we have to hold the reigns loosely on what we expect from each participant. Although both parties probably prepared themselves with what they wanted to say, the whole shooting match was done "on the fly": planned remarks can be forgotten, and there were distractions galore. One minor quibble I have with Ken is that he said "one creation museum". Incorrect, since there are several creation museums, but I reckon that he was meaning that there is one creation museum with a full-sized Noah's Ark. Another small problem I have is the use of the term born again. Yes, many (if not most) Christians use it, but the more accurate translation is born from above. My last item against Ken is that he left out something that he knows: Noah could have hired help to construct his Ark, it wasn't necessarily only eight people building it. I'm sure both Ham and Nye thought of things that they meant to say after everything was said and done. I've read comments where people wanted Ken to throw down on Bill and give him so many facts that Nye would fall on his knees and repent. Doesn't work that way, old son. As was evident in the formal debate, this engagement demonstrated that the origins controversy is not so much about facts and evidence, but the worldviews used by which they are interpreted. Ham would attempt to explain things many times, and Nye was not willing to listen. In fact, he would do something that gets many people banned from The Question Evolution Project: change the subject and attack. My impression is that from the get-go, it was easy to see that Bill Nye was fastuous, on the prod, and looking to score points in a "Gotcha!" game against Ken Ham by giving him a verbal slap down. Several times, Nye turned to onlookers to preach about the glories of science, even though he admitted that it was a philosophy. Then he'd contradict himself. He would say that we know, speaking for scientists in general. ("We"? He is not a scientist, but a sciolist who played like a scientist on a children's television show .) He disagreed with Ham on almost everything, and did not even want to admit that the Ark Encounter was well crafted. Ken made it clear that AE was not intended to be seaworthy, nor was it constructed with tools of the era (which would be speculative), but Nye kept gnawing on the bone that AE had concrete and steel, and was not seaworthy. Bill Nye was insisting that his version of climate change was of paramount importance, even though he does not understand it himself . He endorses criminal prosecution of "climate change dissenters"  — I disremember if this is Stalinist or fascistic. He gets mighty cranky when confronted on his weaknesses on that climate change thing . 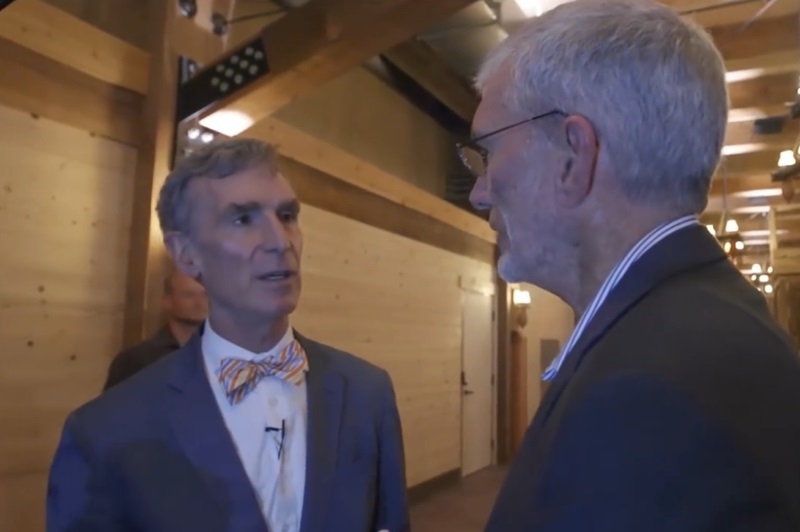 Regarding biblical creation, Nye said to Ham, "I would prefer that you weren't indoctrinating young people with anti-science", yet Nye is the one indoctrinating children, especially with falsehoods about climate change . He kept saying that he is "skeptical", but that is disingenuous, because he has his mind made up that the Bible is untrue and that biblical creation science is false, even though he has insufficient knowledge. Nye is opposed to teaching children about creation science, calling it "indoctrination". (This can be called "playing the children card", which is similar to playing the fascist card ; both are ways to manipulate emotions.) He also encouraged children to attend universities and secular museums — which are strongholds of materialistic indoctrination based on opinions and interpretations of evidence. Nye calls them "facts". Not hardly! Mayhaps he wants secular education systems to have free reign with indoctrination. Essentially, creationists are wrong and Nye's view is right because science. We're all descendants from Martians, said Nye. No evidence for this, but his science of the gaps philosophy insists that his view on this is valid because someday it will be proven. That's not science. He had the nerve to tell a Christian girl, "You have a simplistic worldview". In another instance in the last few minutes, a little girl asked Ham a question about how God did his creating. Nye interrupted for a moment, then after Ken finished his answer, Bill tried to override what Ham said with his naturalistic Scientism. Bill Nye is being fitted for a millstone even as you read this . Bill had numerous logical fallacies, and I hope people who watch the video will keep an eye out for logical fallacies. Something that is extremely important in debates as well as other serious discussions is to know what the other side actually believes and teaches . In both engagements, Bill did not do this, and engaged in straw man fallacies. In one notably low moment, Nye engaged in another ridicule, asking why the money spent on the Ark was not used in more productive ventures. That really puts a burr under my saddle, because not only is it a red herring, it is just plain vacuous . Elsewhere, he used the fallacy of irrelevant thesis. When Ken asked about information and DNA coming from materialism, Nye used the false thesis fallacy that people are the proof that it happened. That really took the rag off the bush, and it's where I laughed. Yes, look for not only the aforementioned elephant hurling, but more red herrings, argument from incredulity, poisoning the well, circumstantial ad hominems, genetic fallacy, and more. I took several pages of notes, but I'm cognating that this article is plenty long enough. Ken Ham showed considerable patience and tolerance, far more than I could have. His overall goal in engaging Bill Nye (and all of the Answers in Genesis ministries) is to uphold the gospel message. This is the goal of other creation science ministries as well. He was not there to smack down Nye, and I know of some people who are disappointed that he did not use an evidential machine gun. But then, he'd be like Nye, wouldn't he? EDIT 3-19-2017: I stopped looking at my notes too soon. Bill Nye said that he had never heard of historical science before he met Ken Ham. He should know his own evolutionary history, as the term historical science is not unique to Ham, nor did it originate with him. One notable example of its usage is by Ernst Mayr. 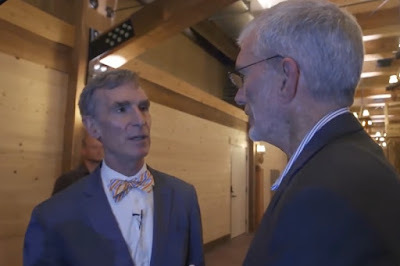 Bill Nye was arrogant and condescending, and it seemed to me that he expected people at the Ark Encounter to act like Donall and Conall, who said to Patrick, "Remember that we're simple people, without your fancy education and books and learning" . Nye is not a "science guy", but is a propagandist for atheism, Scientism, evolutionism, anthropogenic climate change, abortion  (yes, I know, not supposed to bring new material into the conclusion, but I couldn't help myself), and other leftist interests. If people want science, logic, or to be heard, they should not be going to Bill Nye. Further, people who want to know what biblical creationists actually believe and teach (such as the "Debate Answers" ), they should go to the sources instead of to anti-creationists with agendas. Despite what Nye and others who ride for the Scientism brand want, some of us believe in offsetting the indoctrination of our children by secularists, teaching biblical truth to our children.